German Porphyria Expert Centres to start distribution of SCENESSE® (afamelanotide 16mg) Clinuvel Pharmaceuticals Limited (ASX: CUV; XETRA-DAX: UR9; ADR: CLVLY) today announced an update on the company's post-authorisation distribution of SCENESSE® (afamelanotide 16mg) across Europe for adult patients with the rare disorder erythropoietic protoporphyria (EPP).1 SCENESSE® in EPP SCENESSE® is the first approved treatment for EPP, a genetic disorder characterised by acute phototoxic reactions (anaphylactoid reactions and burns) and forced withdrawal from exposure to all forms of visible light. Clinuvel conducted clinical trials of SCENESSE® in EPP from 2006 to 2013. The APF would like to take this opportunity to remind you how important it is to continue our fight for this revolutionary drug to be approved in the USA. PLEASE keep sending us your photos and stories. We will not stop submitting your stories to the FDA. Thank you for all you've done already! The old adage, No Pain, No Gain, may work well in certain instances, but for porphyria, No Pain, No Gain is a terrible maxim. Most patients agree that porphyrias do not fit within the mainstream of painful conditions, like broken bones, labor pains, muscle spasms, etc. 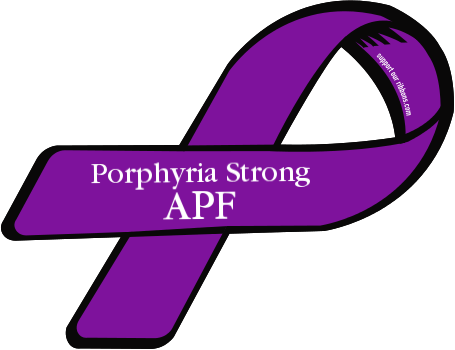 Porphyria pain is so severe that it is difficult to explain, but the people below have used their own extraordinary descriptions. After you read their quotes, you will understand why porphyria has gained a reputation as one of the most painful diseases. Victor Mejias (EPP) It itches and burns so bad it makes me climb the walls. Emily Melone (AIP) It is like “charlie horses” in my intestines. Mike Boone (AIP) I want to unzip my skin and step out. My ribs feel like they are being fileted. Karen Eubanks (AIP) I am being kicked with a steel toed boot. Kim Stala (EPP) My hands feet and face are in boiling water for days while a knife is cutting and twisting my in-sides. Monique Jacobs (HCP) My skin is akin to jellyfish stings while my belly burns like a washing machine full of lava. Steve Stevens (AIP) My rib cage feels like the lava inside a volcano with lightning bolts going off. Tara Cantley (AIP) My arm feels like someone cut off the circulation with a tie. Lisa McFarland (EPP) It's like sticking your hands in a vat of hot frying oil with no relief in sight. Stacy Hermann (AIP) I feel confused, angry, and full of deep despair. I cry at nothing at all. Rachel Shinn Olstad (HCP) My daughter says it is like a knife stabbing her thigh over and over. Debbie Rohn (AIP) My daughter says it’s like getting stung by thousands of bees and peroxide in her veins. Deb Miller Gilbert (VP) My nerve endings are firing all at once and I do not get a break from it. My nerves are so overstimulated that a loving hug from my son is excruciating. Tara Cantley (AIP) Someone is squeezing my arms and legs until they go numb and nerves feel as if they're burning. Theresa Flagg Jurls (PCT) An inflated object with steel spikes caught behind my right ribcage. Rachel Johnson Keith (AIP) Demons are chewing their way out of my gut and standing in a pile of fire ants. Nicole Marie DiRoma (AIP) Severe burning torch in my stomach, being pregnant for your whole life and muscle pain like a 500lb person sitting on you and won’t get off. Rachel Ballew Campbell (AIP) It feels like someone is slicing your insides with a straight razor, while pouring hot lava through them. There really is no way to explain it. Beverly Tuberville (AIP) Fire ants are all over. Jennifer Taylor Nay (AIP) It feels like I am digesting glass shards. Gregary Scott Allen Edwards (AIP) It’s like being run over by a steam roller, shot by tasers repeatedly, and hav-ing all my life force batteries drained instantly. Terri Witter (AIP) I have a tummy full of broken glass. Mary Schloetter (AIP) My bones feel like rolling in glass shards and acid moving through my veins. Episodes are called 'attacks,' I agree as I'm standing alone on a battlefield being hit with guns, cannons and tasers. Christine R. Baer (AIP) I have a knife through the abdomen, and my insides have jitters and dancing and moving. Lisa Coleman-Vinson (AIP) It’s like digesting huge, hot rocks with bone crushing pain. Theresa Flagg Jurls (PCT) Steel spikes poking into my abdomen and ribcage, steel clamp gripped to pelvis. Beth Nye (AIP) A 600lb person is sitting on my stomach and twisting it like a wet towel to remove all the water. Nicki Theisen Maus (AIP) My insides feel like they're on fire! Rogers Reyna (AIP) It’s like aliens use my back as a trampoline while chewing their way through my gut. The nerve pain burn is fire ants having a festival in my arms and legs! Patty Harris (AIP) Firing swords of hell with demons eating their way through your stomach back, legs, arms, and head. Let’s face it, porphyria is burning hell. Joe Mrsny (PCT) I look like I have leprosy because of the blisters breaking open. The itching is unbearable and causes scars and it usually comes at night so I am sleep deprived. The sun hurts. My finger nails fall off so I am unable to button my clothes. I just want to lay down and stay out of sight. Whitney McCabe Stevens (HCP) Reality is, I can't accurately describe the pain of an attack because it is the most horrendous and overwhelming pain I have ever felt! On the pain scale of 1-10, it's 10,000. In my opinion, words simply can't accurately describe what we endure. During a wonderful ceremony last night in Washington D.C., Desiree Lyon Howe, the Executive Director of the APF, was awarded the 2016 Rare Impact Award by the National Organization for Rare Disorders (NORD), which represents 23 million Americans with rare diseases. Desiree is grateful to receive this award and had a great time celebrating with her family, friends, and colleagues. Desiree credits the success of the APF to the members and the Scientific Advisory Board. Variegate porphyria (VP) is an autosomal dominant disorder that is a member of a family of disorders referred to as the porphyrias. Each disease in this family results from deficiencies in a specific enzyme involved in thebiosynthesis of heme (also called the porphyrin pathway). The term porphyria is derived from the Greek termporphura which means "purple pigment" in reference to the coloration of body fluids in patients suffering from a porphyria. The porphyrias are classified on the basis of the tissue that is the predominant site of accumulation of metabolic intermediates. These classifications are "hepatic" or "erythroid". Each disease is also further characterized as being acute or cutaneous dependent upon the major clinical features of the disease. VP results from defects in protoporphyrinogen oxidase. VP is classified as an acute hepatic porphyria. VP is also known by the names porphyria variegata, protocoproporphyria and South African genetic porphyria. The disease is quite common in South African whites (hence the related name of this disorder) with a frequency of 3 cases per 1000 persons. This high incidence has been traced to a founder couple who emigrated from Holland and were married in 1688. The protoporphyrinogen oxidase gene (PPOX) is located on chromosome 1q22 spanning 8 kb and encompassing 194 exons that generate two alternatively spliced mRNAs, both of which encode the same 477 amino acid protein. Several different mutations have been identified in the PPOX gene resulting in VP. These mutations include missense, nonsense, and splice-site mutations as well as deletions and insertions. Except for the mutation found in the ancestors of the South African founder couple, most mutations in the PPOX gene are unique to each affected patient. The South African founder mutation is a missense mutation where tryptophan is substituted for arginine at amino acid 59 (R59W). The clinical manifestations of VP are highly similar to other acute porphyrias such as acute intermittent porphyria, AIP. The term "variegate" assigned to this particular porphyria relates to the fact that the disease can present with neurological manifestations, cutaneous photosensitivity or both. Common symptoms include cutaneous photosensitivity, abdominal pain, constipation, nausea, vomiting, hypertension, tachycardia, neuropathy and back pain. Disorientation and frank psychosis may be conspicuous features of VP. The symptoms of VP are rarely manifest prior to puberty. However, individuals homozygous for PPOX mutations exhibit severe clinical manifestations of VP at the outset of childhood. Clinical manifestation in VP becomes apparent in the event of an increased demand for hepatic heme production. This most often occurs due to drug exposure or some other precipitating factor such as an infection similar to the precipitating factors in AIP. If a drug is the cause of an attack its use should be discontinued immediately. Women using oral contraceptives are particularly susceptible to the cutaneous manifestations of VP. Most individuals (at least 75%) who inherit a PPOX mutation are asymptomatic throughout life. Treatment of VP involves a high carbohydrate diet and during a severe attack an infusion of 10% glucose is highly recommended. Hemin arginate is used to treat acute attacks of variegate porphyria but is not effective in treating the cutaneous symptoms associated with the disorder. Last week the APF sent this stack of over 600 PAGES (2 and 1/2 inches tall) of EPP pictures and stories to the FDA Commissioner! We have not slowed our efforts one bit and we will to continue to fight! Keep sending us your personal stories, letters, photos, etc... We need to keep putting pressure on the FDA! Summer is HERE. It is unacceptable that we do not have approval of Afamelanotide/Scenesse and we will not stop until we have achieved our goal. Join the APF in fighting for this revolutionary treatment to be approved in the US! Look for the areas that may need help, buy making a list. Hold a regular family meeting to to keep everyone up to date. Very important to include the patient and let them express their wishes and concerns. Ask family and friends when they are able to help and what jobs they think they can do. Be clear about what you need help with. When you do hear back from them, note it on your list and make sure they haven taken care of what was needed. Also show your appreciation to all family and friends for their continued support and help. One thing that I have done with many people including myself is when sick and others help I keep a notebook by me who called, came to visit or help, and what he or she did, so that while it is fresh in my mind I can go back at a later time when i'm well to Thank them specifically for what they have done.